The historic ‘Market Place Shopping Centre’ was originally constructed in 1851, utilising a cast iron framework with feature fretwork panels and dowel pinned lattice roof trusses. 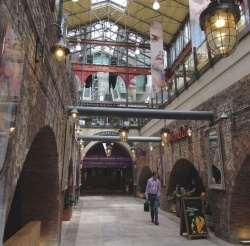 The redevelopment adds a 9-screen cinema complex extension on the roof of the existing building, and restructures the central feature atrium to provide further restaurants, bars and cafés in the underground ‘Victorian’ arched vaults. A steel-framed solution was selected to maintain the slimline effect of the existing structure and minimise the weight of the cinema extension. Steel also suited the restrictive nature of the site where the shopping centre had to remain fully operational throughout, in terms of the speed of erection and omission of temporary works. 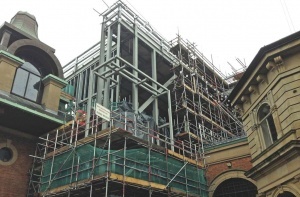 Internal strengthening and remodelling of the existing four-storey steel framework was needed to carry the additional loading from the cinema extension and amended escalator runs. This included the installation of underslung stiffening beams to the existing floor members, and the incorporation of two new 16m long 762 x 267 UB battening beams to the underside of the existing floor at level 2, to facilitate the removal of the central section of a primary existing steel column, in order to provide clear unrestricted access to Cinema Screens 1 to 4. Whilst a tower crane was available for approximately 60% of the upper roof extension, with a working radius of 78m, the balance of the cinema above level 2 had to be installed using a series of spider cranes and Roust-A-Bout lifting frames. All of the internal steel members for the strengthening and remodelling works between basement and second floor level had to be hoisted through service holes in the existing concrete slabs and ‘hand-balled’ into position. Steelwork Contractor Shipley Structures Ltd.
Main Contractor McLaren Construction Ltd.